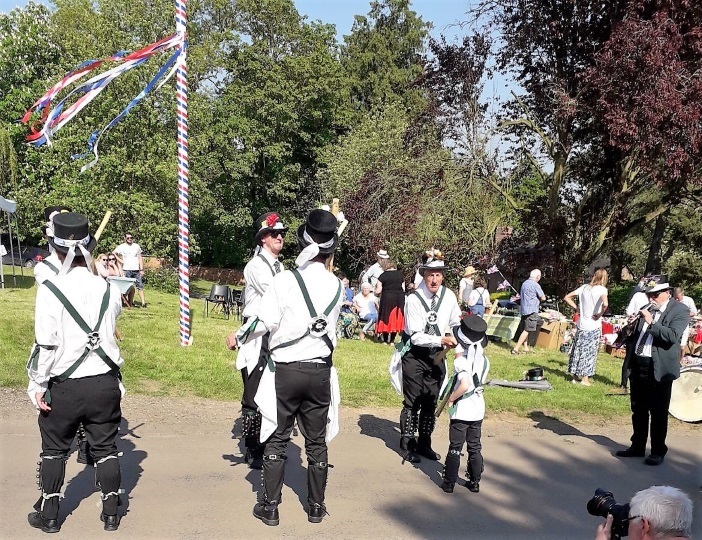 On bank holiday Monday 7 May, AVMM were invited to perform at the unique May Day celebrations held in the village of Preston on Stour, Warwickshire – for the first time. The May Queens procession was a highlight, being led by AVMM, followed by the May Queens entourage, the Lost village Morris and the masses of the village. The village green, like no other, was resplendent with May decorations, including Her Majesties May Throne and enormous Maypole. Cries of ‘all hail the Queen of the May’ greeted her coronation, in front of the magnificent church of St Mary with it’s wonderful avenue of yew trees. Then AVMM performed an array of dances for an appreciative audience of people from Preston and the surrounding villages. They were later joined by the Lost village Morris for a traditional Princess Royal. Children’s games, tug of war and dancing around the Maypole all followed along with a cup of tea and a slice of cake. It was a privilege to be part of such a joyous and none commercial community event. Truly a little piece of heaven in South Warwickshire.